I'm 59 years old going on 60 in 27 days is it too late for me? i want to play the violin so bad. Is there any hope? Should I learn the notes first or should I work on the handling of the violin and its parts? It is not too late. Hello and welcome. It is a beautiful and wonderful thing... The violin. Don't think of it as too late.. Or that you are too old... Think of it as how lucky you are to want it!!! It will become your greatest pleasure and longing. Reesesr ... go for it. 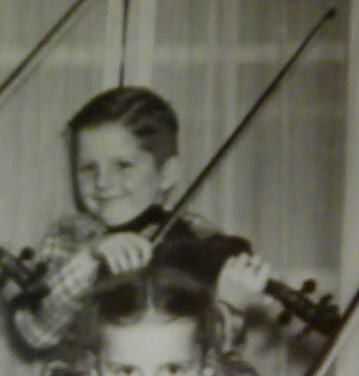 @68 I began with a free violin with cracks, no bridge and needing strings. I learned to fix those things and play a few tunes on the violin. Between 68 and my present 70 I switched allegiance to the mandolin (and the group let me stay) and the tunes are beginning to come and I am having a huge amount of fun. So you have a 10yr headstart and I do wish I had started that little bit earlier. We most probably wont become world famous players but playing a musical instrument has become a great outlet for my creative side. The folks here at Fiddlerman and Fiddlerman 'Pierre' himself are a straight up welcoming and helpful bunch and you will find a number of us for whom weekends and birthdays have become just another day to make music. I'll let the others answer your question about whether it's too late because I know we have a lot of players here who asked the same question a while back and are enjoying their journeys and participating in projects and performances. Start off by learning to hold the violin and bow properly, then begin drawing open strings on the violin. When you are comfortable with that proceed to learn notes.... etc..... There are plenty of great beginner books and videos. A teacher helps too but is not completely necessary. It all depends on your discipline and time put in. Pierre has many videos and tunes here ya won;t have any trouble finding tunes ya like . I think Uzi's right. How old you are is largely how old you think you are. Unless you have debilitating arthritis, it's mainly your mind that you have to convince. If you're lucky enough to be retired with time on your hands, then you're in a nearly ideal position to learn something new. And if you're still working, there's probably still time. A Greed, never to late to lean! Welcome to the forum and enjoy you new passion. It's never too late to learn something new, whatever it might be. Unless your health limits you, I believe you should just get a violin and start to learn right away! Welcome to the forums, by the way. @reesesr .... so what do you think? Are you ready? yahoo.... jump in and start playing and posting. Welcome again to the forum. I believe there are two things in life that don't have an age: love and learning something new. If you love the violin and want to learn it, go for it! I just turned 59 in Sept and it's never too late. You just realized all you've been missing out on! Ha. I started almost 3 years ago now and I'm so glad Pierre had this site, it has helped me more than you will ever know, and everyone here (except Pierre of course) has been down your road before. Enjoy the ride, it's fun. Thank you my newly violin family for your words of encouragement during the beginning of what is a part of my life now and forever. Well, hello and welcome reesers!!! Are you too old? Let me answer this way. When you feel you no longer want some pleasure in life, feel you are unable to bring yourself some measure of joy and comfort, to never start something you have wanted to do for nothing other then just doing it, Then absolutely you are too old. On the other hand. If you pick it up now, make do with what skill you have and learn, be able to say, i am starting a dream, then absolutely you are NOT too old. Will you become a world renowned performer? The odds are against you, me and most of the people here. Becoming a famous violinist isn't my goal. I crossed the 50 yard line earlier this year and am going into my 3rd year playing. I still sound like a live cat is still attached to my strings. I don't play because I am super awesome, I don't play because I am better then everyone on the face of the earth. I play because it brings me a measure of joy and happiness. In this world we cannot change or affect many things without really going out on a limb, and then your chance at real change is small. Music, however, is completely in your control. The joy of learning a piece (even at whatever ability you have) learning about your instrument, music and enjoying it all with friends. A lot of us will probably never see each other in real life, it doesn't mean we cant share in our experiences, help each other along and offer words of encouragement. More then likely a joke now and again too. So, again, Are you too old? Without knowing you are all, I would most assuredly say, "Absolutely not". You are never too old to start playing. Just don't make unrealistic expectations and always remember to have fun. Its not a race or a test. It's life and we only have 1. Enjoy the moments you have, when you can. If you're able to do something you enjoy along the way, so much fuller your life will be. I hope to see you here as a regular. Most of us don't bite. This sort of question seems to come up so often with violin. I mean, do fishing forums get people wondering if they are too old to start fishing? In art forums do people ask if they are too old to be able to draw? @reesesr NO! I started learning the violin just after my 58th birthday! @FiddlerMan is right learn to hold the violin and bow properly. As an adult I was able to realize no this is not just a way for one person to torture another - there must be a reason. Well I confess I did think for a while it was a way to weed out those who aren't really committed to the idea of learning the violin!! I have discovered though it is easier to find the right notes, tone is good and a person is comfortable for extended periods of time when positions are correct. Relax, loosen those muscles and dive in!! @DanielB Early on in my jam group when asked at what age I had started and how long I had been playing I told them my goal was to be the next Grandma Moses of the violin!! I actually have a head start on her. hehe!! If you think about it.. what if you told someone exactly how many years and days old you are and ask if it is too late to learn violin.. (or anything else, for that matter).. and they take out a calculator and a book with a chart in it and look things up and calculate for a minute then look up and say "Yeah.. Sorry. Definitely too late. You missed it by just one day. If you had started yesterday, you might have had a chance. But now? There is just no way.."
Ok would you actually accept that? Really? Just nod and hang your head low and walk away, never to try? Or would it be more likely to just get your attitude up, and tick you off enough to get you to set your jaw and say "We will see about that... Youngster." and get busy on the work it takes to make them eat some of your dust ASAP? "Stubborn" is one of those character traits that tend to improve with age. It can be your very best friend when practising. Whether you aim it at success or failure is entirely up to you. I've seen adults at all ages, and you'll find there here too, begin learning to play violin and are very happy they did so. However, if you think it will come easily and expect absolute perfection, think again. If you are looking for a fun hobby and think you can enjoy the journey, then you are at the best age possible. Perhaps you have more time than you did when you were young. Perhaps you know more what you like and appreciate music in a better way now. How old will you be in 27 days if you don't start ? Go for it, I'm 71 and play.